Mounted on a smoothly rotating rail, it lets you pass bottles, glasses, appetizers and more without reaching. Each product is hand-made, so no two products are alike. NOTE: Cannot be used as a cutting board. Is this an authentic barrel top? What is your response to the questions regarding the odor of the varnish? Has this been fixed? BEST ANSWER: It appeared authentic to me, it was a wedding gift and the couple raves about it. There was no varnish smell either. The bride's mother ordered one for another gift. I have purchased 2 and have been very satisfied. There is no odor. 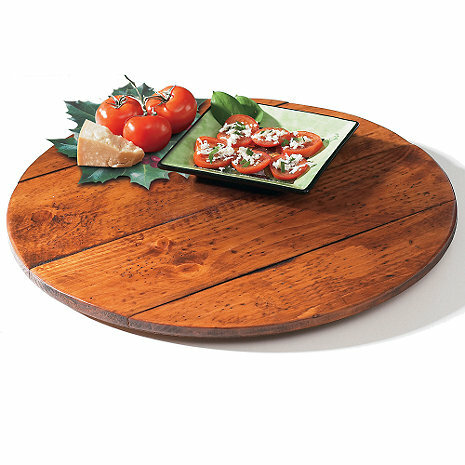 We love our lazy Susan and get compliments on it all the time! If it is not authentic, it definitely looks like it is! Hope this helps. As stated previously, It is a hand-made solid wood barrel top and there should not be a varnish smell. My guess is that it is not an authentic barrel top. There is no odor from the varnish. It is a hand-made solid wood barrel top and there should not be a varnish smell. BEST ANSWER: Thank you for your question. The diameter of the rail is 12 inches. Remember the diameter of the lazy susan is 22 inches. If you have further questions, please let us know at 1-800-356-8466. The diameter of the product is 22 inches. BEST ANSWER: I don't feel qualified to answer this definitively without more data on the TV, since we only use ours for decanters, appetizers, condiments, etc. It is heavy wood but the "ring" underneath sits about 5"back from the edge all around so it could be a little tippy if the weight of the TV wasn't evenly distributed. There is less than 1/2" of space between its underside to the table top. I suppose it could work if you placed some sort of stabilizers under the outer edges. Hope that helps. I would not recommend placing a tv on this, these are made mainly for glassware, decanters or plates only. If it is a small television it should work but not a large one. Is it sealed? Will liquid leave marks, such as a glass with ice sweating? BEST ANSWER: The Wine Barrel Lazy Susan is sealed but this will not prevent marks from appearing on it after a glass has been left on it for some time. I would either waterproof it with an outside stain and/or not leave cold drinks on it for any length of time. I personally wouldn't put an iced glass on it, but I do have kids, and I do have guests that aren't knowledgeable, so they might. Since it will be a staple on my table, I just wanted to know if it would hurt it before finding out the hard way after I spent the money. That's why in the world I asked the question. Please can you tell me the diamater of this Lazy Susan. BEST ANSWER: Thank you for your inquiry. The diameter of the Barrel Top Lazy Susan is 22". If you have any further questions, please contact a storage consultant at 800 377 3330. Thank you again. It makes our square dinette table much more functional. Our dinner table needed this! My mother had been wanting a lazy susan for awhile. She wanted a basic design, only wood, and no writing/ nothing personalized or monogrammed. Fortunately, she likes wine so the wine barrel added to it character. When it arrived, it is much more beautiful in person and well made. Makes a great addition to my wine collection and bar. This Barrel Top Lazy Susan looks wonderful on my parent's kitchen island. I am now thinking about getting one for myself! This is a solidly constructed lazy susan. It works well inside (depending on the style of your home)or on an outside dining table. I purchased it to use on my patio table for outdoor entertaining. The size is great and makes it easier for everyone at the table to access condiments, seasonings, and snacks. I Absolutely love the lazy Susan. I had a custom dining table built and it adds so much to it. Could not be more pleased. I highly recommend this product. The lazy susan is well made and the graphics are excellent. I'm very pleased with the purchase. We ordered a second one for our son but without the graphics. He loves it! The lazy susan looks GREAT! But, the finish used (stain & poly?) had a distinct odor that took a long time to go away. Also, the turning mechanism makes too much noise - it seemed a bit 'cheap'. This was a gift and the recipiants LOVED it - so all in all, I'm glad I bought it.